DOCTOR WHO - Which are the best WILLIAM HARTNELL stories? | Warped Factor - Words in the Key of Geek. DOCTOR WHO - Which are the best WILLIAM HARTNELL stories? For our final look back at the best stories from each Doctor's era, Dominic Fellows looks back at five of the best from William Hartnell. The original, you might say. 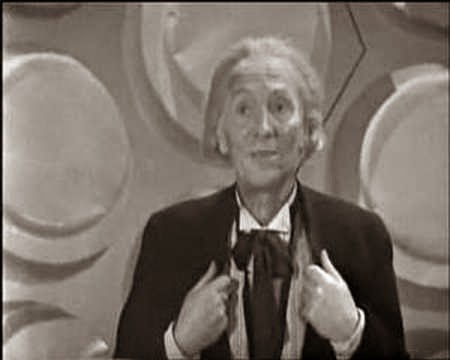 Picking the best of William Hartnell is tricky. I love the era as a whole and I love particular episodes, but I struggled to single out any adventure. Many of the opening episodes are outstanding, only to degenerate into more standard fare. The thing to remember when viewing these is that the audience who saw The Hartnell years were not fans. They didn’t pick it apart; every single episode was intended as a half-hour diversion and nothing else. With this in mind, the average viewer could be forgiven for thinking of it as over a hundred individual episodes. And it’s because of this, that it manages the not unimpressive feat of being everything to everyone. It’s the most experimental and every era has borrowed from in since, sometimes in obvious ways like the Daleks, sometimes in less obvious ways like the re-introduction of individual episode titles. And it’s thanks to this that it is able to be whatever the viewer needs it to be; whether it be historical, pseudo-historical, futuristic, quest, invasion, contemporary or comedy, it’s the malleable framework that shaped a TV legend. There is not much new to say about this story so I will simply say why I love it and it’s for one reason; that farewell scene. The very first of many and to me still the most heart wrenching and, fifty years on, still has the power to bring a tear to my eye. A moment so good it got used again nineteen years later, so powerful every fan knows it by heart. What makes it work is that it is so preposterous. 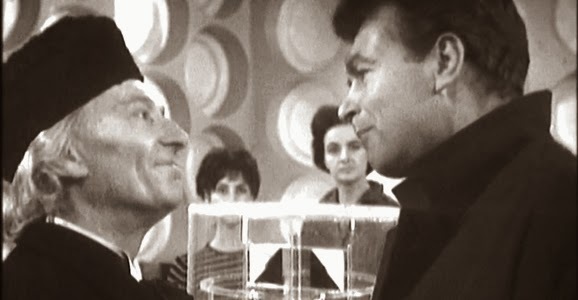 As if anyone could abandon their grandchild in a foreign land with a guy they just met and think they were doing them a favour, but you believe it because William Hartnell plays that scene so magnificently with such sincerity and sensitivity you believe every word he says, you even end up agreeing with him. Proof that he was not just an eccentric character actor but a very thoughtful and brilliant one too. ‘The Tenth Planet’ doesn’t have all that much going for it. In terms of story and execution it’s fairly static and acts as ‘not-quite-ironed-out-the-kinks-yet’ template for the Troughton era’s ‘base under siege’ plots (if the siege was very relaxed and well-mannered). Yet two very obvious and wonderful things stand out. The Cybermen of course, much maligned on this occasion for being so cheap. Personally I find them very creepy. I love how they are very recognisably human; here you can see the human eye, human hands and cloth covering a very human face together with the part mechanical/part human. I don’t think Cybermen could ever be represented like that today in high definition in a show with a much higher budget. That would be far too scary for 7:00 on a Saturday. And of course the other big development here; regeneration. The first is still one of my favourites. 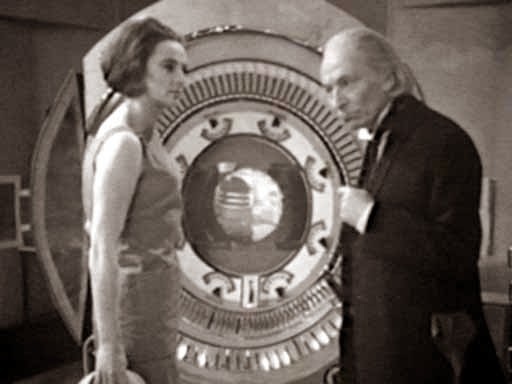 Often bemoaned as not as spectacular as it should be, I once read a comment that complained ‘Hartnell doesn’t get a farewell speech’ an attitude that irritates me immensely, since when did the Doctor have to make impassioned declarations about major life events? No, he simply offers sound, Grandfatherly advice; ‘keep warm’ and quietly wanders back to the TARDIS and accepts his fate. How like the First Doctor. I love it when Doctor Who goes into Earths past but I get so bored with the old ‘aliens did it’ plot, and when you are presenting a culture so radically different from our own they may as well be aliens, a subtle point but well made. Our regulars are the intruders here, with Barbara somewhat self-righteously enforcing her view upon the Aztecs fully functional and contented society. When viewed from the other side Tlotoxl is not entirely unsympathetic. 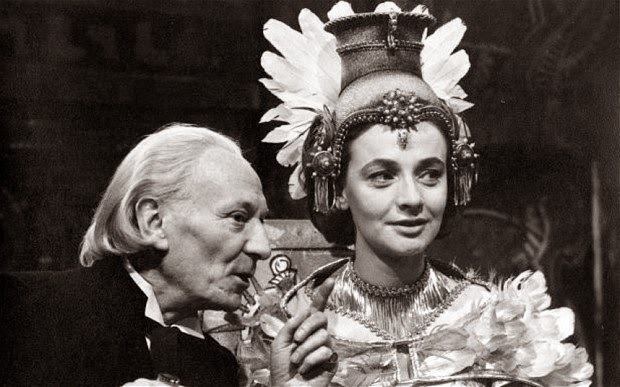 But what I find most brilliant about ‘The Aztecs’ is that heroes loose ‘they have to’ as The Doctor tells Barbara. It doesn’t get the props it deserves but this is quite a radical thing to happen this early in the series and sadly one that is seldom used again which is a shame as it calls for an amount of emotional investment. Not bad for a show that was allegedly a bit of filler for the kids. There is a wonderful fan-made trailer for the proposed third Peter Cushing Dalek movie which has been cobbled together from hammer horror clips and features Dracula, the Mekons (Mechanoid substitute) and a very unconvincing robot Doctor. I laughed at this as I thought it was intended as a spoof and then I realised; they’ve got it spot on. That is exactly what happens in ‘The Chase’ and oh my it’s camp! This is a point of contention amongst fans but given that my only other experience of sixties TV at the time I saw this was Adam West’s Batman and whose only prior experience of Hartnell Who was ‘The Romans’ I just assumed that this style was just the norm. I presumed all other sixties Who was camp and the silliness of the Daleks was there at the outset and they were toned down as they went along. ‘The Chase’, in which case, perhaps typifies its era of the swingin’ sixties, more than most. There’s the ‘slow’ Dalek, the somewhat psychedelic Dalek TARDIS (never used again), the blatant borrowing from other fiction (Dracula and Frankenstein), tinkering with history (the Marie Celeste) and of course, just about every science fiction element is more fiction than science which brings me to another element; The Time TV, The thing that alerts the Doctor to the Dalek situation so that he may stay one step ahead. It amuses me immensely that something as mind-bogglingly useful as the time-space visualiser is never used again, I like to think that the reason we rarely see the Seventh Doctor in the TARDIS is because he keeps nipping in to check it. And The Beatles are in it. Yes, I know it’s a complete cheat. But how could anyone write a ‘best of William Hartnell’ list and not include all three of these masterpieces which by now must surely be classed as culturally significant. Individually, I don’t think this batch of episodes is particularly special. It’s one amazing opening episode, three so-so episodes with cave men, four mind-blowing episodes that introduce the Daleks, three fairly dull ones with Thals and then two downright oddities stuck in the TARDIS. It doesn’t sound liked the makings of an iconic TV phenomenon but put them all together and; to quote Arnold Rimmer ‘somehow it works, it becomes right’ and at the heart of this is the loose story arc of the regular characters mistrust of each other which is present throughout all thirteen episodes, a dramatic device that would never be used again on account of the fact that once we get to know The Doctor he can never be played in this way again. And he is not a nice character here. Arrogant and unpleasant in a way that puts people in danger, far worse than anything the Sixth Doctor ever did. Yet this is what makes him compelling and set him above other heroes of the time and I use the word ‘hero’ very loosely. At this point the show could have been called ‘The Adventures of Chesterton and Wright’ without any change to the format. It’s they who guide us through; they are who we empathise with. The Doctor’s world is always more exciting when viewed through our eyes, something Russell T. Davies was clearly aware of. We take them for granted now, but this could have been all there ever was of Doctor Who and there are so many people who contributed to it, but the one I’d like to single out here is David Whitaker. After editing the first two stories he is faced with the now famous ‘fill the last two episodes with no extra sets or cast brief’. He rightfully constructs a two-part coda that not only brings the character finally together but would have actually been a satisfying conclusion had the series not continued and no one give him props for this, but ‘The Edge of Destruction’ is the very first story to make the mundane frightening by use of melting clocks, the ship seemingly operating itself and the infamous scissor scene. Viewed on their own; ‘Edge’ is frankly weird ‘Daleks’ is run-of-the-mill adventure fare and ‘Child’ excluding the first episode is a dull run around. Put them together and they become a majestic character driven adventure serial with enough iconography to sustain a show for fifty years and beyond. So which do you think are the best William Hartnell Doctor Who stories?